Cleaning badly rusted metal does not have to be hard work. Since red rust (ferrous oxide) formation is an electrochemical process (oxidation), all we need to do is reverse this process. During oxidation, electrons are given up by iron and combine with oxygen. The result is ferric oxide (black rust). When ferric oxide oxidizes, ferrous oxide is formed (red rust). What we need to do "reverse oxidize" the red rust (reduction); hence, donate electrons to the ferrous oxide. The electrolyte will support current flow between the cathode and the anode. To make a complex subject short, the red rust on the item attached to the negative terminal will be reduced to clean metal and a form of black rust that is composed mostly of magnetite, and the item connected to the positive terminal will be converted to red rust. The beauty of this process is that the bond between the resulting clean metal and black oxide is much weaker than the one between the metal and red rust. This black rust will powder off easily. All that is needed to remove it is steel wool or a fine wire brush. To build our electrolysis station, we will need the following items: a non-conductive container to hold the electrolyte, box of washing soda, 12 Volt battery charger (the process with work with as little as 2 Amps of current), and scrap ferrous metal (rebar works very well and does not contain the toxic metals chromium and nickel as does stainless steel). Washing soda (sodium carbonate) is usually available in the laundry additives section of better supermarkets. The brand that I use is manufactured by Arm and Hammer. In a pinch, electric dishwasher detergent will work as it is mostly sodium carbonate mixed with sodium silicate (water glass). To make the electrolyte, add one tablespoon of washing soda per gallon of water. Washing soda tends to clump, so one needs to take one's time and make sure that it is completely dissolved before proceeding. After one has the electrolyte mixed, one needs to submerge one's cathode (rusted part) and anode (scrap ferrous metal) in the solution. Position the cathode and anode such that they are very close to each other, but do not allow them to touch. Please note that the anode is going to be oxidized to nothing over time, so try to keep the positive terminal out of the solution. The negative terminal can be submersed. Also, please have the power to the charger disconnected whenever connecting/disconnecting the terminals or adjusting the anode/cathode. Water is separated into hydrogen and oxygen gas. On nuclear submarines, electrolysis is one of the methods used to replenish oxygen. The resulting hydrogen is pumped over the side, and for good reason, it is flammable! Hydrogen and oxygen, when mixed in gaseous form, are an extremely explosive combination (remember the Hindenburg). Once one has one's anode and cathode situated, one can apply power. However, please insure that one has good air flow in the room in which electrolysis is being performed as one does not wish to experience gas build up. 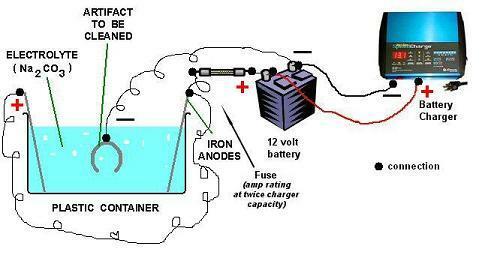 In closing, one additional benefit of electrolysis is the scrubbing that occurs as hydrogen is released at the cathode. These bubbles clean the contaminants from the surface of the metal, and if given enough to time to work, will remove paint as well.